Thanks to good management practices – especially by states to our south – and an overall warming trend along the Atlantic Coast, red drum are expanding their range. That’s good news for Chesapeake light tackle fishermen because redfish will readily attack a jig or a topwater plug. Even if you’ve never targeted redfish before, chances are you already know how to catch them. Almost all the artificial lure techniques we’re currently using for stripers will work for redfish. As stripers continue to decline, redfish are moving into their habitat and populating the underwater humps and ledges where stripers used to feed. 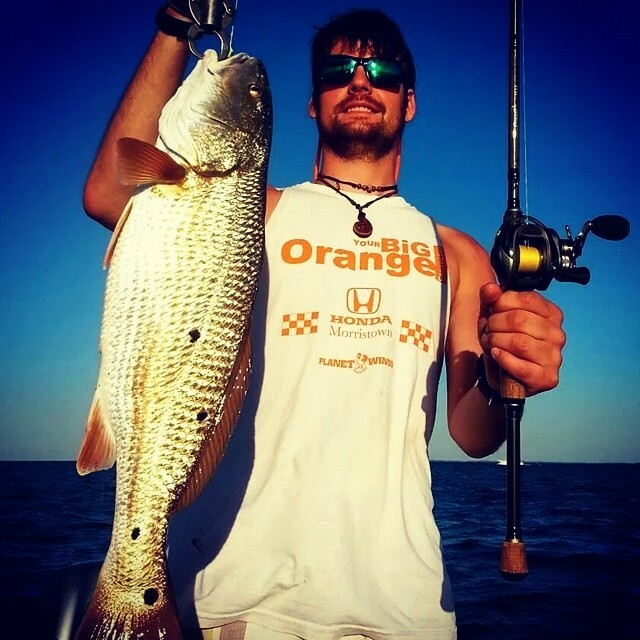 While the best places to catch redfish are farther south in the Chesapeake Bay and on down the Atlantic coast to the Gulf of Mexico, there are three or four spots close to home, just south and east of Kent Island, that are becoming good redfish locations. These were once can’t-miss striper spots, but since I can’t really count on catching stripers there anymore, I’m thrilled to occasionally find these places loaded up with nice-sized redfish. 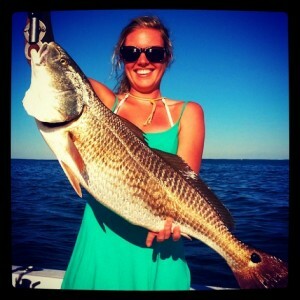 Redfish that are less than 30-inches long are often referred to as puppy drum. They commonly feed in shallow water, especially around beaches and tidal flats. Even though they are often found in the shallows, they are also fond of underwater structure and will feed in deeper water when conditions are right. In the Maryland part of the Chesapeake Bay, the right conditions for redfish usually mean oysters and lots of them. Redfish don’t eat oysters, but they prey on organisms like small crabs, worms, and minnows that are found near them. 3-D oyster bars are especially good habitat. By 3-D, I mean bars that aren’t actively harvested so oysters have grown up from the bottom into plumes. These plumes create reef-like structure where fish and other marine organisms can hide. The oysters also filter the water so it’s much cleaner around them. Most of the oyster bars in Maryland have been knocked flat by commercial dredges, but if you find one that is still growing, chances are there will be a lot of fish there. Fortunately for recreational fishermen, the state has designated some areas as oyster sanctuaries. As a result, it’s getting easier to find 3-D oyster bars. That means more redfish habitat is coming available. My best fishing for reds has been in locations that hold a lot of bait, like oyster bars that are situated near underwater ledges that drop from 15- or 16-feet down to 24- or 25-feet deep. 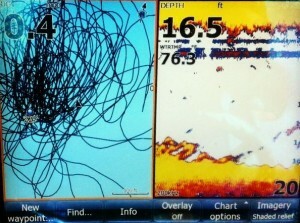 The fishing is even better when there is additional underwater cover like rocks or grass. Redfish feed during periods of moving current just like other Chesapeake species. My technique is to set up on the ledges and bang the bottom with a 6″ BKD or 5″ Gulp Jerk Shad. I prefer to use bright, contrasting colors like chartreuse and white, and I always add scent to my lures. Just like with stripers, I use the lightest weight jig head possible that lets me feel the bottom on every drop of my lure. One of the bonuses of targeting reds is that they tend to be around other species of fish. I’ve been finding bluefish up to five pounds while looking for reds in the Mid-Bay, along with a few small flounder and croaker on the 3-D oyster beds. I’ve enjoyed several evenings chasing redfish over the past couple of weeks, but only found them twice. I expect more redfish to move in as the summer progresses. Currently in Maryland you can only keep one redfish and it has to be between 18- and 27-inches long. Most anglers prefer to release them so fishing will continue to improve. Good catch and release practices are essential. Red drum are a little tougher than striped bass, but a lot of fish will die if we don’t handle and release them carefully. Since they’re slippery and have small teeth, it’s tempting to put a hand in their gills. That’s a good way to kill them. Your best bet is to use a rubberized net or reach down and grab smaller reds by the lip. A slot red won’t bite you too bad. If you really don’t want to lip your fish, use a Boga Grip or similar holding device. Lipping a red and keeping your hands off their body helps prevent loss of slime. It’s usually better to hold puppy drum up by the mouth to prevent slime removal, but don’t ever hold a heavy bull drum up by the lip or pull it over the rail with a Boga Grip. Instead, reach down and put a wet hand under the belly to support its weight. Don’t ever use a knotted twine net because it will split their fins. 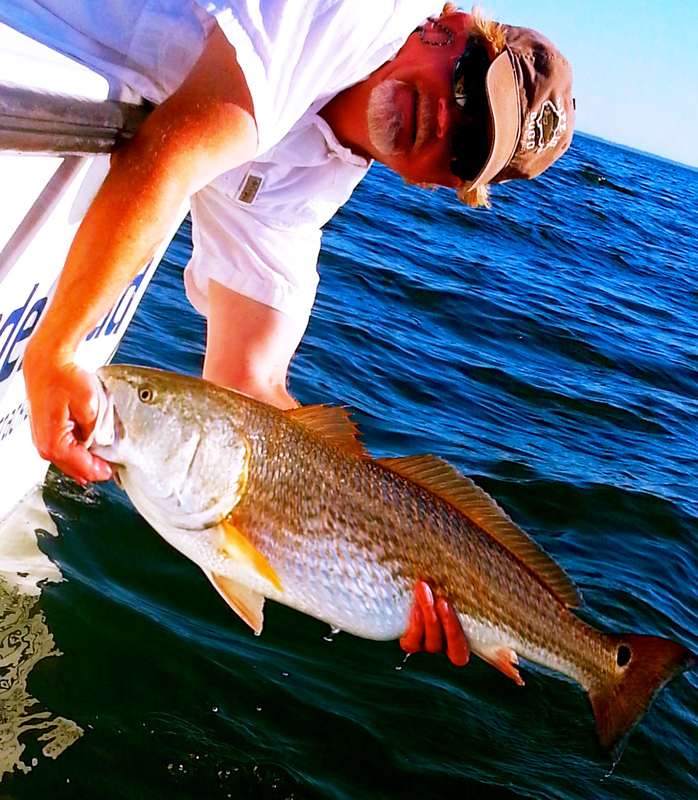 You should also be aware that redfish “stun” more easily than stripers. In other words, they go into shock and won’t always swim away when they’re released unless you revive them first. Just move them forward in the water until you feel them get strong enough to swim away on their own. With good catch and release techniques we can help build up a dynamic red drum fishery in the Chesapeake Bay. All the fish in this report were caught over the past couple of weeks. We’ve had a lot of company since the 4th of July holiday — all of my trips were with family and friends, including a couple of evenings with my grandkids Ella and Tucker. While they didn’t get any reds, they had a blast catching stripers and bluefish. You can see some of the action in the video below. Frankly, if redfish continue to rise in our area of the Chesapeake, I’ll target them more frequently than stripers. They are strong and incredibly fun to catch. If you catch one, check back on that spot often, because where there’s one, there’s usually more. Whether it’s redfish, bluefish, or striped fish, good luck fishing. I hope you smile a fraction as much watching this video as I did making it! Thanks for the tips Shawn! Gotta love some redfish action close to home. Thanks for posting this… I plan to look for those red ones next trip. 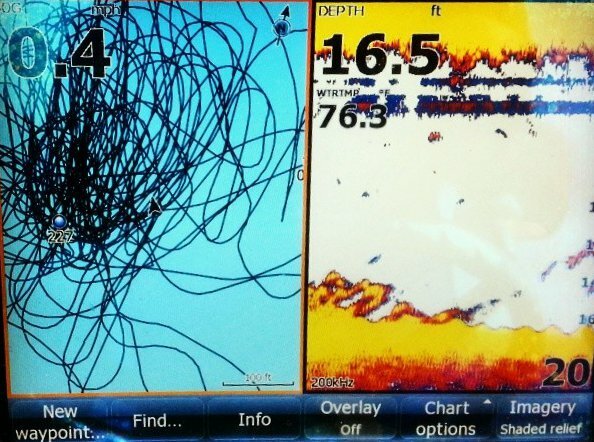 Two years ago we caught a few way up in the Chester River at a place where a person would more likely expect to catch a LM Bass. It is good to see them returning this year. Only caught one last year and it was way down the bay. Being from Central Florida, I’m excited to see Reds up here. These guys can be super fun to catch and great eating (on the smaller side of the slot). 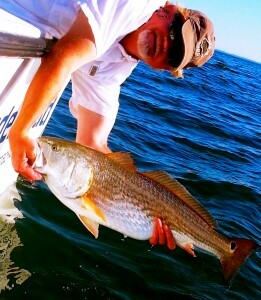 Catch reds often down on Kiawah Island near Charleston SC. They fight much harder than stripers. And they taste even better in my opinion.